Heya lovelies!! So another week has gone by. I can't get over how fast this year is going. (Oh hey there cliche blogger remark). So please don't judge but other day I finally decided to download the Countdown to Christmas app on my iPhone. I know! But this was when it still said '100 Sleeps Till Xmas'. I don't know why but when a countdown to something reaches 100 or less than 100 everything seems to go by a lot quicker. Christmas is also my favorite time of the year so I'll be glued to that app until it says '50 Sleeps' then I'll start panicking and making lists and I'll be losing my head over what presents to get people. Even though I love Christmas to bits, its so stressful! But anyway enough rambling from me. Today I thought that I would take you through my evening skincare routine. If you read my blog regularly then you will know that I have reviewed a lot of this products in full so I will be leaving the links to those as I mention each product. So let's get started. So if I am just coming back from a long day out or if I've been for a meal somewhere and have lots of make up on the first thing I do is apply the Liz Earle Hot Cloth cleanser and apply this evenly all over my face. (REVIEW HERE) After that I take the muslin cloth that comes with the cleanser and stick that under the hot water, rinse it out and remove all traces of cleanser from my face. I love doing this as it also exfoliates my face so I don't really feel the need to buy a separate exfoliator. If I have applied a lot of make up on I will repeat this step twice. After that I apply the Liz Earle Instant Boost skin tonic. I apply this to a cotton wool pad and I will then remove any existing traces of make up. I like to repeat this step until there is no dirt on the cotton wool pads. Weird I know. After I've cleansed and toned I will then apply one of two masks I use. At night I will apply the Dirty Works Moisture Mask. I love this mask as it is more of a creamy consistency. Therefore when you apply it its basically like applying moisturizer to your face except it's a lot thicker. I like to leave this mask on whilst I have a shower. I leave it on for 5-10 minutes (I time this using my phone) and then will rinse off with the shower. It is so much easier than leaning over a sink and splashing a ton of water to your face to get everything off. Once I've applied the mask I'll get ready for bed (drying and moisturising my body if I've just had a shower, brushing teeth, getting into PJs, etc etc you know the drill) and then I'll apply my Simple Kind To Skin Vital Vitamin Night Cream (I've photographed the day cream (REVIEW HERE) because I've run out of the night time version but it's symbolic okay?!) and I love using this as it just locks in all moisture and works with the mask brilliantly. Once this is done I will then apply a lip scrub (which I forgot to photograph so forgive me) and I like to use the Lush Bubblegum Lip Scrub. (REVIEW HERE) I apply this to my lips and then lick it off which is of course my favorite part. Then I take my baby lips lipbalm in Hydrate (REVIEW HERE) and apply that to my lips and then I am officially ready for a good nights sleep. Or in my case lately to watch Downton Abbey or 90210. Two amazing shows that I would highly recommend. Please click the links beside each product I've mentioned to see full reviews on these products. If you would like a full in depth review of the masks then please let me know below. I have a love hate relationship with them at the moment so if you would like to know why let me know and I will get that up for you all to read. What is your evening skin care routine like? 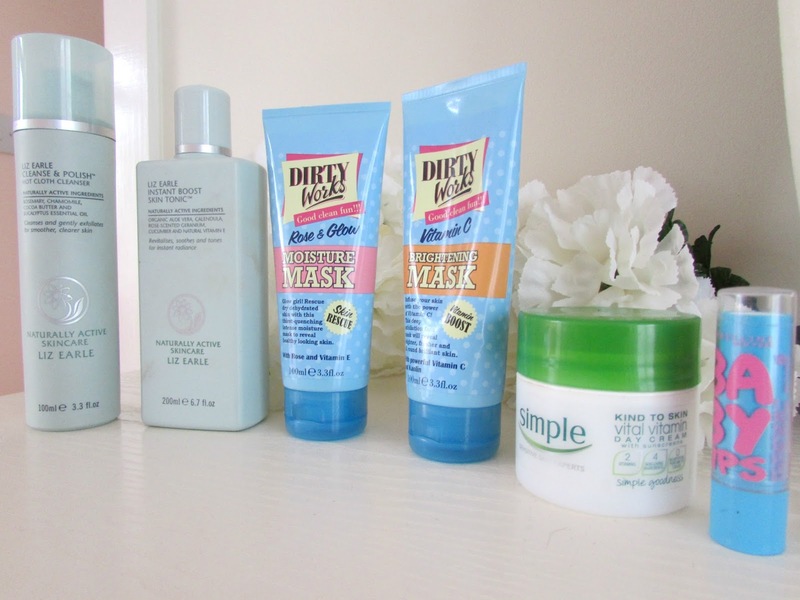 Do you use any of these products? If you have a blog link or video then please leave a link to them below so I can check them out. 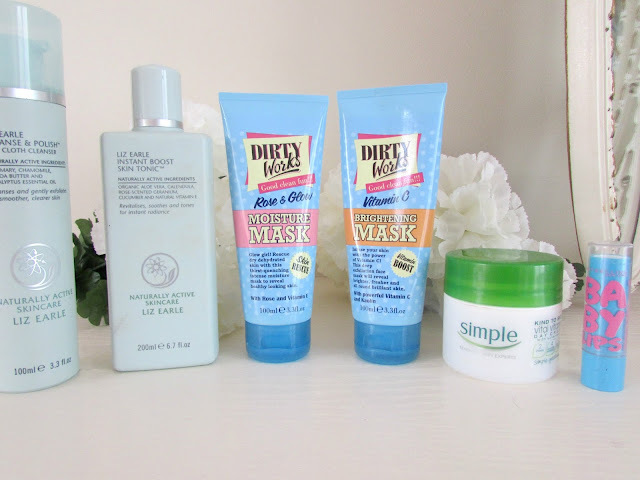 Great post :) Love the dirty works masks.